To all you aspiring writers out there, the world needs your contribution! Consider this your sign from the universe to make it happen. The Modes of Writing class with my incredible coach and editor, Nick Jaina, will inspire and encourage you to take the steps to create the work you’ve been dreaming of. “The structure for this class borrows from the first eight cards of the Major Arcana of the Tarot. I am interested in identifying “modes,” or styles of writing in order to be intentional about them, and find a way to benefit from the different moods we find ourselves in when we show up to the page day to day. Then the work is to combine those pieces into a cohesive whole. This eight week course is designed to take your nascent idea and bring it into physical form. I have found that most people have a comfort zone of writing: either they like describing a place but are afraid of characters, or they like writing dreamy stuff but it’s never funny, or they can write technical pieces but don’t know how to animate a story. I think it’s worth spending a week each on different phases of writing and see how they all can add up to a more complete piece for us. This class is appropriate for whatever level of writer you are. I have had people take it just to find some structure in their life so they can start writing, and I have had people attend who are in the midst of writing a book and trying to find their way home. 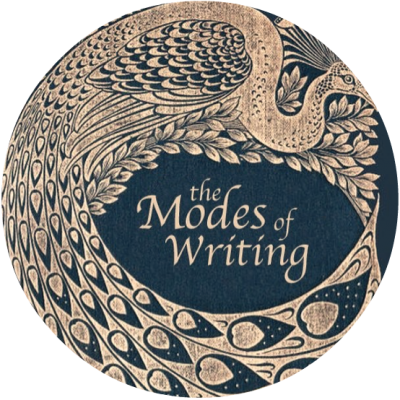 The Modes of Writing starts this Sunday, October 7th. It’s video conference format, affordable pricing, and payment options make it super accessible for you, the writer who is ready to DO THIS.